Editor’s Note: Cicadas are large, flying insects that typically emerge from their underground habitats en masse in July and August. 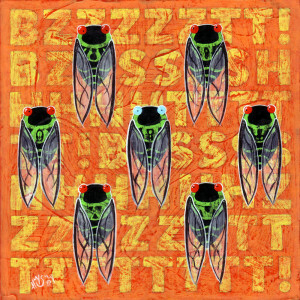 In many parts of the world, summer is synonymous with their buzzing communal song. Some species, like the species that is the subject of this story, spend seventeen years underground before emerging, dying a short time after they breed. At the beginning, the Everything we knew was dark. For so long we lived in the deep Always-Under, unaware of what came before. We drank of the life-giving Wood-World, and Cicada lived well. We lived this way for what seemed like a life-age. Always unmoving and imprisoned on all sides by the moist earth. Every long cycle we heard a call, a beckoning to our kind, but we Cicada would not answer. Even while we heard rustlings of activity above, of similar ones leaving this cradle of dirt, we did not rise. Many times the call was heard, but ignored. We continued on like this. An unmoved mover, every one. But one day, Cicada felt something deep inside him turning. The soft Always-Under around him grew warm, the call grew too loud, and somehow all knew it was time to awake from the long dark Underneath. I felt the walls around me crumble and the roof above me cave in as I pushed upwards, as we all did. Just below the surface, I hesitated, uncertain was I in what lie beyond, but the insides of Cicada propelled him on. Finally breaking through the sky of the Always-Under, the bright, shining Always-Above would have burned Cicada’s eyes, so unused to anything being bright, if only he had eyes to see. Still, something within Cicada bulged and the body we had all known was no longer ours. Driving our shell-home up the very tall sky-woods, we scaled it as a mountain stretching forever to the Always-Above. But soon I could no longer crawl. My joints felt stiff and my body swelled. Cicada’s Shell-Home had become too small. I sat and felt my body crawl around me. I soon realized I could no longer remain in this skin, and I pressed on the ceiling until it split and I emerged, for the first time, into the Everything. On our fresh, pink flesh we could feel the cool air that was never ours to feel before. Alive for so long, but only now was I finally birthed into the Everything. Only now was I truly Cicada. My new eyes blinked in the bright Ever-Shining and for the first time we saw things! Shapes and colors were now ours! Flapping, we pumped Life-force into wings we had never known before, spreading them in the Bright Always. With each flap, I could feel myself becoming more full, more Cicada. Life-ages had passed us by before we could finally live on our own. We were many, then. All at once, we had been born. Around me many Cicada stared in amazement, and though we had never seen with eyes before, we all knew each other. We had all been waiting many long cycles for the day we could finally look upon the Everything with new eyes. The Dark Times were over, our new bodies quickened in the Bright Always. Finally, all at once, we knew it was time. The flapping of wings was many then, as it was time to leave the Wood-World of our births behind, that which sheltered and fed us since we were Small Crawlings. I shook off the remains of my Shell-Home, which had housed me for the long night in the Always-Under, and flew. No thing anchored me or Cicada to the Everything anymore. The Always-Under and our small, cracked bodies were cast aside. It was time to let go of old things. It was the Dawn of Cicada-Time. Cicada flew. Many we were, it almost seemed we were too many for the Everything to hold! As our wings flapped furiously, freed from the shackles of their Shell-Homes, a one among us was drawn to the Bright Always and desired to touch it. But The Ever-Shining was too far away and could not be reached, no matter how high we flew. It was not for touching, we learned, though we were still thankful for it watching over Cicada. In the Always-Under, Small Crawling had known only digging. Even when we sensed others like us had gone above, we waited. When new Crawlings came, unaware of the Everything in the Always-Above like us, still it was not time. Eventually all other Crawlings we had known went above and never returned. It was this way many times, our newly born cousins sharing our earthine home, then hearing the call, leaving us to our solitude. We came to understand that they were no more, but what that meant we did not know. But now was our time Above, after so many cycles, so we flew. Our wings never wanted to stop, and soaring on, we wondered what had called us to the Everything. After such long cycles of having so much time, suddenly it seemed fleeting. What did we know then, except flying? Cicada desired something more. It was a new place we sought then. A sacred place where Cicada-Time could rise like smoke, a signal for all to know. Below us we saw many towering Sky-Barks, though higher than even them we flew. At last, Cicadas’ wings grew tired from beating against the invisible winds, and I came to a new Wood-World, one tall and strong like mountains. The insides of Cicada whispered in a silent voice that this was where I would make my new home. It had spoken through me and likewise, many Cicada had heard the same voice inside them as well. Soon, the Bright Always became the Bright-Sometimes, it too passing like the wind. The Dark Time had returned, but we were no longer surrounded by the Always-Under, which had always closed in on us like a prison. Cicada was free now and for the first time, of his own free will, he closed his eyes. Awake. Cicada opened his eyes, around him all were restless. The Ever-Shining returned to rest in the Bright Always, a sign that the dark lives of Crawlings were far, far below us now. We were quiet then, fresh to the world and without knowledge of our own voices. In the leafy wings of the tall Sky-Bark, the Ever-Shining peeked through, to better look upon us with its own eyes. Perhaps wondering, as Cicada did, what we were to do next. “Awake,” a nearby voice said, using sounds unknown to me though I could still understand their meaning. Beside me sat a Cicada such as I, though weathered from life, with large blue eyes that saw past the Everything, and those that danced behind it. This Cicada was not new, as we, but had been above ground for many more cycles than we had known. He was old, like the sky-barks and the far away Big Things. “Awake!” His voice carried to us all. We were awake, we had found a place to rest our wings, though now all new Cicada were lost. What does Cicada do besides fly, we wondered, though knew not how to express this puzzlement. The old one, Old Blue Eyes as we came to call him, was making sounds we had never heard before, and had our attention. “All of you, Cicada. Younglings but older than I, yet older I am in the ways of the Everything and the Coming Forever No-More. I have seen many things, Young Cicadas. And I have heard even more, I have heard the wondrous voice you all have within you, singing in a grand chorus that never ends. “We are creatures not long for the Everything. You of all the Broods, who crawled for so long in the Always-Under, while your bothers and cousins went above, sang the mighty song of the Cicada and once more went back into the earth, their Shell-Homes nothing but food for the Wood-World and the new Crawlings where once we all lay. With Old Blue Eyes’ words I felt something within me impassioned. A moving inside me, much in the way he spoke to us, only without words. A call, it was, bubbling up. It was a communication to the Everything that Cicada-Time had arrived on hundreds of wings, that we would be heard! I barely knew the voice inside me, the inside parts of Cicada rubbing together to create some brand new sound. And soon the sound grew louder, though not merely through me. All around me, Cicada joined in. Everywhere around us, Cicada sang for the first time. For so long we had been silent, unaware of this music that lay within us. We were finally awake, and Cicada was silent no more. “TOGETHER NOW, TOGETHER!” Old Blue Eyes implored. As we continued to sing, we knew not what his words meant, but slowly among us, an understanding could be heard. Voices began merging together as the song grew naturally, less discordant and more a genuine melody of nature, pleasant to the hearing-things. BBBBBBBBBBBBBBBBBBBBZZZZZZZZZZZZSHHHHHHHHHHHHHHHHHHHHHHHHHH, we all sang together. The air around us was heavy with our song. Confident were we that all around us, all manner of creature nearby would hear the Song of Cicada. So we sang and sang and when our lungs grew tired of proclaiming our newfound existence to the Everything, others took over for us, continuing the never-ending Cicada’s Song. And when they grew tired, so then did we take over, our voices rising high and strong once again. Old Blue Eyes was content then. Long had it been since he’d heard the song of his people. Long had it been since he heard Cicada. As I was busy filling the All Around Us with my music, it did not go unnoticed that while not singing, Old Blue Eyes seemed to be smiling. Cycles passed in this way. The Ever-Shining came and went, beating its hot gaze upon us as our songs grew louder and more elaborate. Old Blue Eyes told us we must sing loudly and of the Glory of Cicada or else the Bright-Always would disappear forever. He told us that when it flew far beyond the sight of Cicada, it was only our song which would bring it back the next day. So we sang. Our voices combining from many into one. And while our music was wide and carried across the land, soon we heard other voices from far-away Sky-Barks. It started as a distant strum on the horizon, a faint chorus not unlike our own. But soon the sound rose until we felt it in our bellies. It seemed like the Sky-Bark itself was rumbling in response to their song, daring us to sing higher, louder, more fiercely. It was a challenge posed and accepted. Louder we sang, higher we crooned, more ferociously did we flap our wings. The noise we made did glorious battle with theirs until both joined together, synching up to the rhythm of nature. When we sang louder, they relented. And when finally we grew weak, they in turn took over. A dance, it was, of two warring nations. As we pitched our song and dodged their melody, We came to understand in our own way that this warcry was coming not from an unseen enemy, but from others like us, Cicada of a different tribe. When at last our music combined into one momentous tune, all voices and songs working in unison to play the orchestra of the world, we realized in that day that war was over. Peace had come to great Cicada Time and surely the Bright-Always would not want to disappear for a very long time. Soon Cicada from other tribes traveled to our land. A momentous intermingling of cultures resulted, we taught them the songs they did not know, and of the great long darkness in the Always-Under. They did not understand our long journey through the bowels of the Earth, as their time as Crawlings had only lasted a short cycle. They revered us as Great Old Ones, though outwardly there seemed to be no difference between us. In our minds, we felt the same age, and possessed perhaps the same measure of the Everything. What separated our two tribes besides vast expanses of time? All Cicada seemed to own the same wings, the same six legs, the same passion for the music of life. We learned of many things from each other that day, all of us both teacher and student at once. A great exchange of knowledge passed between us that day and surely the Ever-Shining smiled down on Cicada sharing with Cicada. But something neither tribe could answer became as bright as the Always Above: what had come before Cicada?, some whispered. The words spread beneath the continuing song, while others looked to their friends and dared to ask: What was the Reason for Cicada? We did not know. And other Cicada did not know either. Our song was low and filled with uncertainty that day, as we wondered how many cycles we would see before Cicada was no more. While much speculation existed in the minds of all that day, it was not long before only thoughts of survival remained. A shadow crossed the Bright-Always, eclipsing the Everything beneath it, and Cicada knew it to be an ill omen indeed. Fast, it struck, a beast most assuredly from the time before Cycles or even the giant Sky-Barks, a sharp-mouthed creature summoned from the dark corners beyond the Everything to prey on the lands of Cicada. Giant wings kept it aloft, like us but not like us. For it thirsted for Cicada blood. One, two, many of our brothers and sisters were snatched up in its maw that day. This creature had long existed to devour us, Old Blue Eyes taught. Unnaturally, it seemed to be in many places at once, sometimes splitting into multiple shadows to hunt. It would have consumed us all, until its belly swelled, but Cicada was too many. Even as we scrambled away from the basilisk, a terrible monster we came to know only as Crow, we sang. Even as Cicada all around us were Cicada no more, flying on silver wings to the Great Forever-After, still the song continued. It could not be drowned out by beak or claw or tooth. Our song hastened but never ended, drumming out the last sounds of fellow Cicada and so too our fears of the No More. We were a never-ending tribe then, too many and too strong to be overturned, no matter how many times Crow split into other Crow to torment us. Deterred, murderous Crow withdrew his attack and flew back to whatever nether realm that spawned him. The we that lived on breathed a calm sigh, that our lives had been spared that day. Alas, Old Blue Eyes informed us, it would not be the last time. Crow would always return but regardless, Cicada would go on. We sang mightily then, and as the Ever-Shining dipped below the Long-Away Hills to chase Crow back into the dark regions of the Everything, a spirit overcame us that we could not deny. Cicada sang of Life that closing day, of Survival and Going On. We danced with our fellow tribes and many a happy Cicada was made that night. As much as we felt the song reverberating within us, something else was growing as well: an urge to seek out other Cicada, to find comfort wrapped in their wings. It was an urge to not spend this time we had alone, for Cicada to be together, as one. Many ones were made that night, and the song, though tinged with sadness for our fallen brethren, continued rapturously on. We continued like this, with an ever-vigilant eye fixed on the horizon, but otherwise content with our place in the Everything and carrying a song in our lungs. We made the most of our days, cavorting and flying about, sometimes dropping out of the Forever-Going song, the Anthem of our lives, but always returning back to it later, to continue our proud proclamation to the world. As long as one Cicada drew breath, Nature and the great Ever-Shining would never wonder as to our whereabouts. A few wise Cicadas soon observed that the Bright Always’s time was beginning to grow less. Old Blue Eyes taught us that the Ever-Shining, ceaselessly chasing away demons and warming the Everything, was growing old, as were we. And like all things underneath it, we would all pass to Forever-Darkness. “But no!” we exclaimed to Old Blue Eyes, “We lived for many cycles deep in the Always-Under, with nothing to see, surrounded by the Darkness on all sides. We survived that, and we will live on for many more cycles, or until we decide to leave”. Old Blue Eyes merely laughed softly to himself, but it was not a joyous laughter. It was filled with remorse and loss. When we implored him to continue, he spoke of the Great Cicada Civilization that had come before ours, of countless generations that thrived while we hid in the life-giving Earth. We did not understand that we had not been the first of a mighty race, that we were not the progenitors, nor the forebears. Many thousands of younglings had come before us, fresh to the world and pumping their wings full of life. They had emerged and coupled and passed on, their younglings returning the following year to renew the cycle, and their younglings after that. A never ending wheel of Cicada Brother and Sister, of songs persisting throughout the bright-soaked days. We had missed them all. Old Blue Eyes sighed, we had lived too long a life, snug in the dirt of the Earth, refusing to emerge, and Cicada Time had passed us by. Wings had flapped that we had never known. Songs had been sung that we did not hear. Some among us, then, questioned why we had ever emerged at all. Should we have stayed in the Always-Under? Would we soon pass like all Cicada before us? “Come”, Old Blue Eyes said, “I have much to show you. Before I and you too pass”. We followed. A mass gathering of the many Nations of Cicada, some born only of the previous cycle, others from before that, and us, from too long in the soft earth. Our song that day was searching, of notes and of destiny. Of timbres and fate. We were hoping both would be found at the end of our journey. On all sides wings beat against the rushing Invisible-Pushing, certainly spirits of a long ago time that the Everything had forgotten, trying in its own way to still be heard, like us with our song. But we would not be denied. We flew and flew, until our wings ached. Inside we felt anguish, fearful of what we might find, but Old Blue Eyes insisted we fly on. And we would not disobey such an Old One as he. During this long time of flight, many Cicada talked of great battle, of approaching horror, of Ancestor Cicada waiting for us, wings outstretched and telling of the Great Forever-Ago Time, when only Cicada ruled over the Everything, with no giant Winged Crow or Morning Robin to hunt us. No one knew what we were flying towards, and as the endless sea of Sky-Woods stretched out beneath us, our song grew solemn and quiet. No Cicada could know what awaited, not even Old Blue Eyes, though the many cycles had not yet satisfied his curiosity. We landed when our wings stung from flying too long and far. It was a dark land, of dying Bark, twisted and gnarled as if the good Mother herself was repulsed. Quiet were we, with only a low hum to signal to the others that inside our chests we still held hearts alive. No other creatures, whether on legs or on wings, could be heard. Only Death walked here. I ventured forth down the limb of a sagging Wood-World, the skin of it peeling off in layers, dropping off and retreating back to the Always-Under in the hopes of beginning the cycle anew. But there would be no new cycles in this graveyard. Something catastrophic had happened here, the Spirits had been angered and inflicted upon the world their wraths. Nothing here had survived. Old Blue Eyes called a few of us over, as he did not want to alarm the others. We approached slowly and as we looked past him we could see it, though we did not believe. Discarded shell-homes lay everywhere, though they were not fresh. Several cycles old, they seemed, long separated from the bodies that had once dwelled within. Cicada had once lived here. In these charred remains, before a great Burning. What had happened to these long-ago Cicada? Had they escaped a fate worse than the No-More that threatens all life? Or had they been caught in the Great Burning, devoured before the many eyes of their brothers and sisters, before they too perished? Or could it have been, unfathomably so, that they had caused this? Could Cicada be capable of such destruction? Did members of another tribe not find peace in their song and instead chose to raise their wings against others? Too many questions buzzed around in our heads. We could scarcely believe it. All around us was quiet; before us, death. No one said anything, and no one sang. And in that hanging silence, we swore we could feel the touch of our ancestors’ unearthly antennae. We heard faint spectre songs from too many cycles before, of dialects and cadences we did not recognize. This ancient song from beyond rose all around us. One brave Cicada droned back in response, trying to make a connection with these lost Long-Ago voices. The song of the dead turned in meters we did not understand, but were most assuredly in response to ours. There was no recourse but to respond in the only we knew: we sang back. Clouds hung low around the tomb-trees, no Brightness could be gleaned through the sky, but this steady, swaying note from behind the tall curtain of the Everything had somehow reached us, piercing the veil. We knew them, and they knew us. Slowly the songs synchronized, living and dying notes intermingling, coalescing, until only one undeniable tune remained. Our eyes were closed, but our minds were not, and yet still we saw. We soon realized that our own voice was growing more and more indomitable, the notes of the Forever-Gone Cicadas dropped off one by one, each one we felt deep down in Cicada. Until there was only us anymore, the Spirits of Those That Came Before could no longer hold on, so long they had been waiting to finish their song, and in passing they finally had. Ready were they now to face the Great After and sing with their fathers for the first time and forever. The moment passed. Not one Cicada ever again mentioned the events of that day. But we all knew what had happened and carried it with us after. We returned to our Home-Woods wiser, stronger Cicada, yet in knowledge of a long-ago land where we had been touched by a cold hand, an inescapable feeling deep within us all that now knew of the impermanence of Everything. What was once a mighty civilization would inevitably fall, what was once ourselves underground had been cast aside like refuge. So long ago it seemed then that we had shed our skins and become fully-formed Cicada, I wondered if a part of me still lived somewhere out there, if the shell I had left behind knew how to defend itself, to feed, to sing? And we knew that there was an End to things, as upon our return Old Blue Eyes fell ill. He no longer felt like himself, he said, and when relating to him my thoughts on the long-ago shells we had all left behind, the Old One remarked how he felt he was now the shell of something else that had left him. Something else entirely, beyond Cicada’s ability to comprehend, with wings of shimmering light, as bright as the Always-Above. We took to caring for Old Blue Eyes in the following cycles, telling him great tales of Cicada valor, of glorious hymns sung in the dying nights, and especially of all the times he had led us, both in flight and in insight to the world around us. As he grew weaker, we sensed he would not last much longer. His song grew quiet one night as we told him of the Great Forever-After, where Cicada could fly and fly, with all the Cicada that came before him. He said he could see it, though we knew his eyes no longer saw anything. Our song was filled with remorse that night, his notes slowly fading out until no voice remained and he was Old Blue Eyes no more. It was in this way that we finally knew the Truth: Cicada Time was ending. The end of Old Blue Eyes was a signal from the Ones Before, just like the glowing flies that shared the night sky with us, a soft beacon in the darkness that eventually succumbed to the light. It was a sign from the Good Mother that birthed the Everything and all of us in it that no matter how bright you shine, high you fly, or loud you sing, that fateful end will always come for you. For some of us it will come gently in the night, for others it will come clenched in the maw of something much bigger. And the world is bigger than us all. No matter how big Cicada thought he may be, nor how proudly he boasted in song to the highest of heavens, it would come. We waited so long to one day see the life-giving light, which we never knew with our eyes; for so long we waited to hear music which we never knew with our ears. We only ever saw the eternal darkness that seethed around us whenever we churned in the night; for too long a span did we only ever hear silence. Our time in the Bright Always had been too short by comparison. With each passing day, more of us passed, as we were all Old Ones now like Old Blue Eyes had been. Our last songs were filled with great tales, of days lost, time spent, and friends abandoned. Of mates, our growing love for each other and the air we breathed every morn. Of new younglings, fathered now in the dirt from which we had once sprung, of what grand adventures they would one day seek. We wondered if we had left the Everything a better place than when we found it, if not a little louder. One thing we did not question, however, was whether our presence had been felt. All had known our song, every creature on both leg and wing. Surely, if they had similar voices, they would have sang with us. And while most of them did not, we believed they hummed along in their hearts. I tried to sing some lasting, final notes: to pen into the chronicles of the world some epic, all-encompassing litany of my experience here and wise words for those we were soon to leave behind, and for those who would one day be. Ian Brooks was born on the West Coast on the mean streets of Portland, Oregon, before living in the squalor of central Ohio and eventually settling in the more pristine and remote stretches of Anchorage, Alaska. Ian attends University of Alaska for English and works fulltime at an artisanal cheese shop. Finding time elsewhere to read, write, run when it’s not perishingly cold out, spend copious amounts of time on the Internet when it is, and hike the majestic landscapes of Alaska regardless of adverse conditions. Ian runs a quasi-popular blog dedicated to diverse artistic compositions at ianbrooks.me.